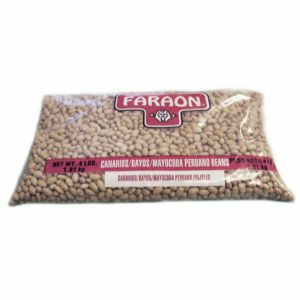 Our four pound family pack Faraon Mayacoba beans offer quality and value. Mayacoba beans are so immensely popular throughout the world that they are called many different names, all leading to this one creamy looking, yellowish bean marvel: "Canarios", "Peruanos", "Mayacobas". Faraon takes a good bean and makes it better by packing the freshest available, then mechanically de-stoning, dusting, and polishing to ensure the very best quality.